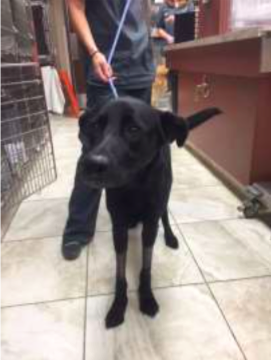 Leah, a 1 1⁄2 year old female spayed Labrador mix, presented for a sudden episode of collapse and bloody diarrhea. Leah is a very active dog who loves to eat anything she can manage to pick up in her mouth. Despite her owner’s best efforts, she will still get a hold of unknown items while out on walks and occasionally in the house. When Leah arrived, she was started on supportive care and blood was taken to get a better idea of what was going on internally. Where blood had been drawn, a large hematoma developed along with extensive bruising. Because of this, blood was sent off to check Leah’s blood clotting factors. Blood work showed that Leah had mildly elevated liver enzymes. Leah was stabilized and treated symptomatically to control vomiting and diarrhea. Later in the day, Leah collapsed and would not get up. Her blood glucose was taken and showed she was very hypoglycemic. She was then started on a glucose drip and was monitored closely. The next day, Leah continued to decline. Her blood work to check her blood clotting ability showed low platelet counts and prolonged clotting times (she was low on clotting factors). Her diarrhea and vomiting improved however; her liver values started climbing quickly. As Leah continued to worsen, her owners were informed she most likely would not survive this unknown toxicity. So determine to help Leah, her owners decided to continue treatment on Leah even though odds were against her. As another day went by, her platelets continued to drop and liver enzymes continued to climb. To try and help Leah’s clotting ability, she was given a plasma transfusion. Her liver was so damage that the transfusion had little effect. As days went by, Leah cling to life as we did everything to help her recover from this toxicity. Her owners visited her twice a day bringing a variety of foods trying to entice Leah to eat. Eventually Leah’s glucose stabilized but her liver enzymes climbed to unseen heights. By day 5 in hospital, Leah, to all of our surprise, decided to eat! Day 7 approached and finally, we saw Leah’s liver enzymes decreasing and her clotting times were back to normal. Once Leah was eating and we saw some improvement in her liver values, she was sent home to continue her recovery. One week later her liver enzymes were almost back to normal. Unfortunately there are many life threatening toxins our pets can pick up from their environment such as mushrooms, sugarless gum, cigarettes, rat/mouse poison, etc. To this day both the doctors and her parents are stumped as to what Leah may have gotten into but we are happy she has returned home enjoying her daily walks and ball play.